(Newser) – Alexandria Ocasio-Cortez made history Tuesday by becoming the youngest woman ever elected to Congress. 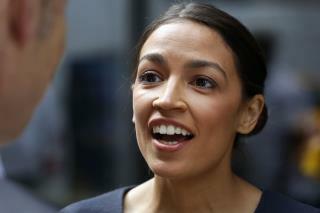 But the 29-year-old Democratic star from New York City revealed to the New York Times that she has an unusual problem as a result, albeit a temporary one. "I have three months without a salary before I’m a member of Congress," she says. "So, how do I get an apartment? Those little things are very real.” Ocasio-Cortez began the year as a restaurant bartender and says she saved as much as she could before launching her political run and pulling a stunning upset in the primary. She is not the first member to have this problem. You know what other members do though, instead of whine to the public that just elected them? Many elected officials have cots that they keep in their office in DC and they sleep on them for the night. No big deal, except this entitled clown thinks that she is unique. They don't turn to the media to get airtime and complain, and turn it into some big conspiracy theory against people who are unqualified for the job and bad at saving their money. And the media eat this up because it's her. Ugh, I wish she would go away already and she hasn't even taken office yet. "referenced the money trouble" ... "working-class"... Ha! I don't understand why she's having a problem. As a democratic-socialist she should be an expert at using other people's money.